After seven weeks of dickwaving, Time Warner Cable and the MSG Network have reached a preliminary agreement that will return MSG to the 1.1 million households that have been blacked out. It's tempting to thank Linsanity, but the reality is more prosaic: the sides hammered out a compromise only under pressure from the City Council Speaker , the Governor, and the Attorney General. The deal hasn't officially been signed, but it's expected to be in place in advance of tonight's Knicks/Hornets game. If you've been affected, you should be thrilled that the Knicks, Rangers, Devils, Islanders, and Sabres will soon return to your television set. You should also be furious that both sides only met once for negotiations during the blackout. While you were stuck following along your low-quality pirate streams and Twitter updates, Time Warner CEO Glenn Britt and Cablevision CEO James Dolan only first sat down this week. And bear this in mind: a victory can also be a loss. The Time Warner/MSG feud was over carrier fees. 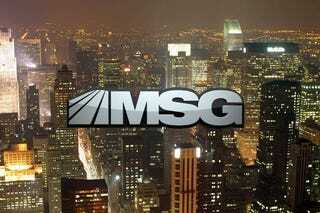 MSG wanted a 53 percent increase in what Time Warner was paying to carry the channel. Presumably, they settled for something less than that, but Time Warner's costs have still gone up. And that'll be passed along to you, dear cable subscriber, the next time Time Warner adjusts its subscriber fees. You really have no say in the matter, nor did you ever. As your reward for suffering through seven weeks without basketball and hockey, you're only getting a bigger cable bill.